Learn how to run coaching programs with ease even if you're uncomfortable with technology! Right click on this free report to download it to your computer. 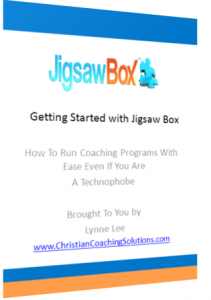 You'll find a step by step guide that walks you through how to create coaching programs online using JigsawBox. The best way of deciding whether or not JigsawBox is the right tool for you is to try it out. While you’re trialing it I recommend you make use of the business coaching modules you’ll find there to help you get clear about your coaching business. I think you’ll be pleasantly surprised with what you discover. You can learn more about JigsawBox at http://lynnelee.com/jigsawbox or click the link below to discover 5 steps to creating online coaching products.